Being British, I'm not ashamed to admit that I have a (completely healthy) obsession with Tea. It's probably not too much of a surprise then that one of the first things that I decided to hook up to the internet was my Kettle. Using some off the shelf parts, a Raspberry Pi and Node-Red I successfully hooked my kettle up to twitter so that it could take it's place among other pieces of technology that really don't have any business tweeting and is just another gratuitous use of the IoT. The design is actually pretty simple; I placed an energy monitor between the kettle and mains electricity so that I could monitor how much energy the kettle used. I then fed this data into Node-Red and created a flow that could detect when the kettle was being used and how much energy it consumed over the course of a boil. Then with help from some 'back of an envelope' maths, I could work out exactly how much that cup of tea cost to make (in energy terms of course). Once I'd gleaned this helpful titbit of knowledge, there was really only one place that it could sensibly go: Twitter. I was able to knock all that out over the course of an evening and left it at that. From it's birth on the 7th of January till April 14th 2016, it registered and tweeted about 632 boils of the kettle. For those wondering, over 97 days that means I averaged about 6 kettle boils, but as I was away for some of that time and that not every boil meant a cup of tea I think I probably consumed between 4 and 5 cups a day! Then on the 16th of Apirl disaster struck. 123-reg who had been hosting my VPS for many years (and where my Node-Red instance had been running), had an incident where a badly written script deleted every single one of their VPS hosts and associated backups. Even worse, they were unable to restore any of my data. I learnt an important lesson that day: Just because it's not business critical, doesn't mean you'll hate yourself if its lost. Take Local Backups. So now in May, with a new and shiny VPS hosted by Mythic Beasts and my first free weekend in what seems like forever, I am slowly re-building my Node-Red flows to automate my flat! So as they say: if it ain't broke, don't fix it. With that in mind, I'm going to leave the general architecture exactly the same as before: The kettle is plugged into a CurrentCost IAM (Individual Appliance Monitor) that sends the energy usage to it's base station; the CurrentCost EnviR. 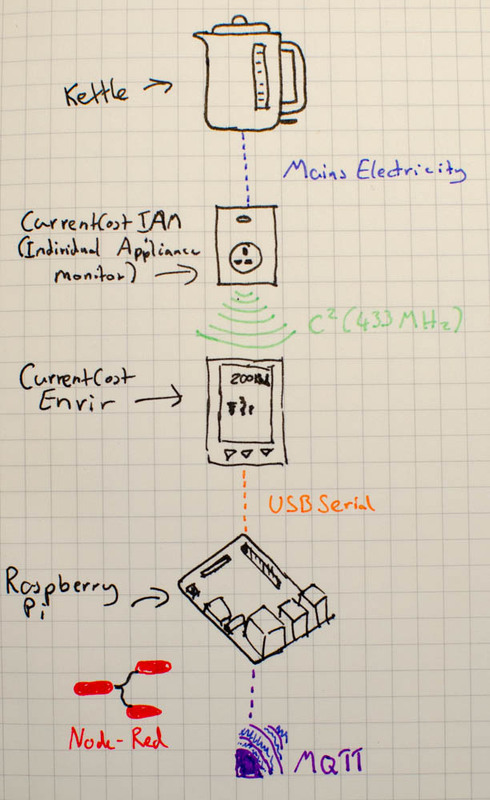 This is then connected to a Raspberry Pi 2 Model B using the included USB Serial cable (CurrentCost are amazing for including this with the EnviR, It's likely this is what made it such a hit with the home energy hacking community!). The Raspberry Pi is then running Node-Red which is listening to the USB serial connection and parsing the incoming data. The energy usage data is the published to a topic specific to the kettle on my MQTT broker e.g. /home/kitchen/kettle. In this case I'm then using a different Node-Red instance that lives on my personal VPS to then process this data, but you could just as easily use the same Node-Red running on the Pi to process the readings. The flow subscribes to the kettle topic and listens for a value greater than 0 (As when the kettle isn't doing anything it is consuming 0 watts). Once a reading greater than 0 is detected , the flow stores the incoming readings in an array and continues to do so until the usage returns to 0 watts. The flow then Averages the values to get a rough estimate of how many watts were consumed to boil the kettle. Finally, some 'back of the envelope' maths is used to calculate how much money it cost by using the 'pence per kWh' value that my energy company provides me with on my bill. Once we've worked out how much it cost, it's then just a simple matter of using the Twitter node in Node-Red to send out a helpful tweet so that the universe knows how much my cup of tea cost to make. Simple! Once you've plugged the EnviR into your Raspberry Pi (Or other computer running Node-Red), you'll need to build your flow to get the readings from the USB serial connection. Drag a serial-in node onto your canvas and open the configuration for a new Serial Port. The most important thing is to find out what serial port the Pi has allocated for the USB serial cable. In my case it was /dev/ttyUSB0, but you should just be able to click on the magnifying glass to get a list of valid ports to choose from, if you've only got one USB serial cable attached, there should be only one in the list. 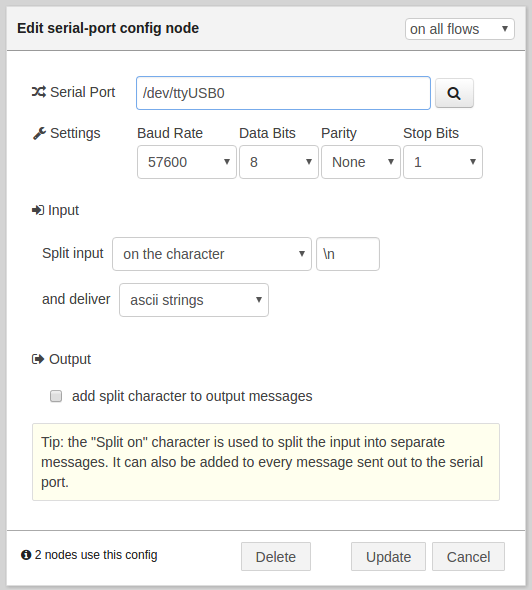 Follow the configuration shown above, it's important to get the Split input settings right so that you get nicely separated messages for Node-Red to parse. // This is the temperature of the EnviR base station, not the sensor. Now you'll be getting a message for every sensor that is paired with the EnviR base station. Normally 0 will be the 'main' sensor that is clamped around your homes electricity connection at the meter. Then sensors 1 to 10 will be any IAMs that you have connected. It shouldn't be too tricky to figure out which sensor is the right one by using some trial and error. Finally you just need to pop in an MQTT node to publish to your chosen topic, or just carry on building the rest of the flow. Now that we're getting regular updates from our kettle, we need to detect when the kettle has started boiling and then record the energy usage during this period. Note: To test this, I replaced the kettle with an energy saving lamp and a remote control socket. This meant that I could play around with the code without racking up huge energy bills or getting up from my chair! Hopefully it's fairly self explanatory, the node listens for a value, if it's above 5 watts (a low pass filter to cut out any interference that the IAM sometimes picks up from other appliances) then it makes sure that the 'kettleCurrentState' is set to true. It also adds the current value to an array. If the kettleCurrentState was previously false, it also adds the kettleStartTime timestamp. If the value is below 5, we assume that the kettle is either not boiling, or has stopped boiling. If the 'kettleCurrentState' is true, we know that we were just boiling. The function then sets 'kettleCurrentState' to false and adds the startTime, and stopTime to the payload. It also takes the array of values and sums and averages them before adding them to the payload. The Array is then reset as well. The message is only returned once this has happened, so we can be sure in the next node that any incoming messages are the result of a full boil cycle. I created another node to calculate the Kilowatt hours that were used to boil the kettle. The formula is actually fairly straightforward. Once I did that, I passed it onto the next node. After a quick check on my Electricity bills, I found that I am currently paying 10.82p/kWh. I'll ignore the standing charge, as that is something I pay every day regardless of whether or not I boil the kettle. So all that we have to do now is multiply the consumed kWh from our previous node by our rate and we'll have the cost for our cuppa! (Warning, it will likely be a very small number!). Whilst I was writing this, I thought I'd also like to add a random tea related quote to each tweet which I think works quite nicely. Once you've added this final function node, all you need to do is add a Twitter node, authorise it with your Twitter account and you're ready to go. Pop the kettle on and wait to see your tea consumption habits broadcast to the world! Hopefully that was simple enough to follow, I designed this system to be fairly modular so it should be fairly easy to use parts of it for other tasks, and of course, you don't need to just monitor your kettle. A possible adaptation that would be quite cool would be to monitor your washing machine, if you had a flow meter handy that you could install in the water inlet you could monitor both Electricity and Water usage! If you fancy stalking my tea making habits, go ahead and follow @IoTKettle, but that would be just weird!